Celebrate Crafts: The Everythings's ABC's letter "L"
chosen as their L element will be featured in their post. My "L" project comes from the Art Philosophy cartridge. I decided to cut the card that is found on this letter. I cut the card using paper from the Claire paper pack. I decided not to use cardstock, but instead chose one of the patterned papers for my card. I cut the card at 4". I am using the star that is in the center of the card for another project. I decided to "bling" up my star with sparkles, to give it a little shine. I stamped on the inside a quote from the stamp set: Scrapbook Statements~Women. The quote is from Dolly Parton, and it says: "If you want the rainbow, you've got to put up with the rain". 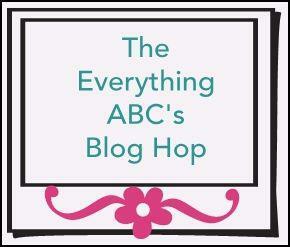 Your next stop on our Everything ABC'S blog Hop is "Shelly Nemitz " of " Just One Piece". So cute ... there are so many options on CTMH cartridges that it seems impossible to try them all. I love how you went with this week's letter to see what popped out :) That little star is adorable. I never would've known that was an option. Cute card! I love the patterned paper is thick enough to make cards. Love CTMH! !